It is important to season the chicken ahead of time, allowing the flavours to penetrate the flesh all the way to the bone. Dry rubbing with salt and spices is the simplest way to season the chicken. Just mix a selection of your favourite spices and salt and rub the chicken inside and out. Wet brine is another way to season a chicken. Basic chicken brine is 4 cups of water, 4 tablespoons of sea salt, fresh herbs and spices, and citrus fruit. Submerge the chicken in the brine for 12 hours, then transfer to a plate and pat the chicken dry with paper towels. Refrigerate uncovered for 3 hours and up to 24 hours. This allows the skin to dry and become crispier. My favourite way is to use a butter rub with spices, such as thyme, rosemary, sage, paprika, garlic and black pepper, and stuff the cavity with fresh herbs and a lemon or onion. This method will give you the crispiest skin. Roasting the chicken at a low temperature of 325 F – 350 F will give you a tender falling off the bone chicken with crispy skin. 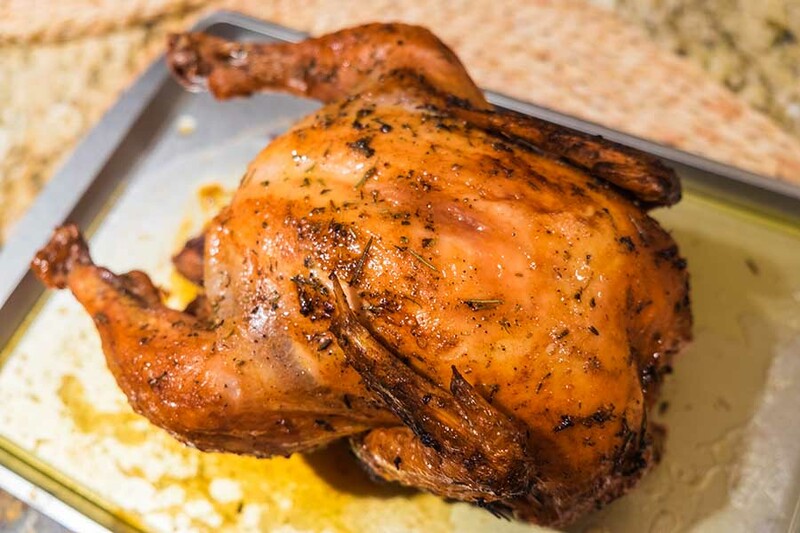 Another method is roasting the chicken shorter time at a higher temperature 375 F – 400 F; this will give you dark brown skin and firmer chewier flesh. The cooking time is approximately 20 minutes per pound. I highly recommend using an instant thermometer, it is the safest way. Insert the thermometer into the thickest part of the thigh without touching the bone. The temperature should read 165 F., or you can insert a paring knife into the thigh all the way to the bone to see if the juices are running clear, indicating that the chicken is thoroughly cooked. Place chicken in the oven and roast for 30 minutes. Baste chicken with pan juices and reduce heat to 325 F. Continue to roast the chicken until internal temperature reaches 165 F basting as needed.